Seattle held a large and long, well-planned Womxn's March on Saturday, January 19, 2019 with thousands of marchers. Many local people were in that march. 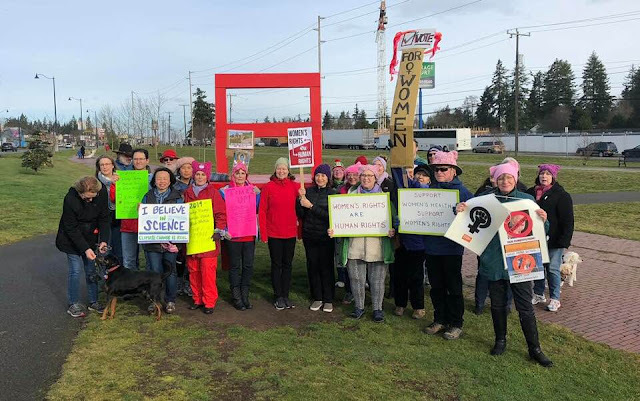 But all over Puget Sound, women who didn't want to participate in a huge march held small, local marches, put together at the last moment, but just as satisfying for the participants. In Shoreline a group of about three dozen marched on the Interurban Trail, from N 175th and N 185th. Ironically, it's men's health we should be more concerned about. Greater occupational hazards, higher suicide rate, higher rate of heart disease, shorter life expectancy, etc. I do like those pig hats though.